Based on reviews from 545 users. Learn how our rankings work or see our guide to The Weeknd sneakers. Updated Apr 2019. Before becoming the choice of footwear for the masses, sneakers were exclusively used by athletes who essentially needed them. Converse first did partnerships with personalities in the 1930s by signing athletes such as Chuck Taylor and Jack Purcell to design their own shoe models. Converse was so ahead of its time that athlete-endorsed footwear didn't happen again until the 70s when Walt Frazier, Stan Smith, and Kareem Abdul Jabbar got their own endorsement deals. However, it was in the 80s when sneaker collaborations blew up thanks to the Jordan sneaker line. It was also in the 1980s that the first musicians broke into the collaboration game. The hip-hop group, Run DMC's song, entitled "My Adidas" scored them a contract with the brand and a customized model of the iconic Superstar kick. Since then, musicians and celebrities have been a vital part of the sneaker world's mania. 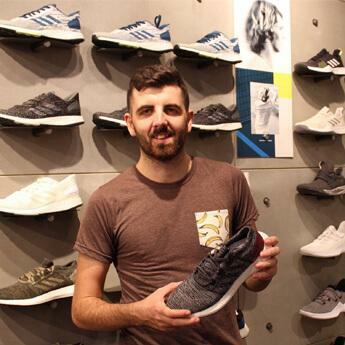 One of the many musicians who has released a stream of successful sneaker models is The Weeknd aka Abel Tesfaye, a Canadian singer, songwriter, and record producer who has had multiple hit songs since he debuted in 2010. Whether you're a fan of The Weeknd or you're merely intrigued by his designs, this section provides in-depth information on the sneakers that he has released so far. Although The Weeknd did collaborations with other labels prior to being signed with Puma, the musician's most well-known and official signature designs so far were done in exclusive partnership with the German sports brand. Here's a list of some of the famous The Weeknd sneakers. Perhaps the most popular among The Weeknd sneakers, the Parallel was first previewed on stage by none other than The Weeknd himself. The shoe is inspired by military and utilitarian gear and was first introduced in 2017. It displays a mid-top yet sleek silhouette that's bathed in neutral colors, which seemed to be the artist's color of choice. The signature model is crafted from premium Italian nubuck with zipper detailing at the rear part and is cushioned with the brand's signature IGNITE technology. This sneaker is evidently the XO Parallel's second iteration. This time the mid-top sneaker is made from soft suede and smooth leather that sits atop a gum midsole design. The shoe ditches the zip detailing at the back and now features a heel tab rear design, which is intended to reinvent casual cleats and enhance the kick's aesthetic. Released in 2018, the Parallel 2.0 is so far only available in one colorway: Black / Gum. As with every sneaker model, there's a significant possibility that new colorways will be introduced soon so better stay up to date for announcements. This shoe is The Weeknd's spin on the brand's arguably most famous model – the Puma Suede. It utilizes the original Suede's trademark characteristics as it features long, sharp lines and narrow tooling. However, The Weeknd wanted to take the iconic shoe to new levels by extending its ankle height to a boot-like silhouette and adorning it with military-inspired buckles instead of the traditional lace-up style. The shoe commemorates the Puma Suede's 50th anniversary since its inception and displays "1968" on its tongue - the year when the legendary model first came out. Abel has done a number of sneaker collaborations before signing an exclusive deal with Puma. He is also known for wearing interesting sneakers, from the Jordan 1 to the Nike Air Mag, so it is not a big surprise that different footwear labels wanted to team up with him for exclusive collaboration pieces. Below are some of the sneakers that The Weeknd designed outside of Puma. This pair is a "promo-use only" collaboration that was customized for his tour. First seen in 2014, The Weeknd customized the iconic profile of the 6-inch Boot and chose a combination of premium black leather upper and olive midsoles for a signature "The Weeknd aesthetic." XO embossing can also be seen on the toe box near the tongue while a few more brandings are placed on the hangtags and collar lining. Fashion designer Alexander Wang and The Weeknd teamed up in 2015 to release a limited edition capsule collection that includes apparel and footwear. The collection includes the Eden High Leather Sneakers, which is a high-top kick made from a combination of Italian pebbled and distressed cowhide leather. An XO branding is embroidered on the tongue, and a white crepe rubber sole finished things off. It includes dust bags and comes with black-waxed cotton shoelaces. Abel signed a deal with Puma in 2016, and the agreement encompasses The Weeknd to be an endorser and a creative director of their products. However, people mistake the shoes he endorses as a collaborative piece because he models them, but the sneakers that The Weeknd models for are separate from the shoes that he actually designed. Abel's signature sneakers that he helped design are listed up top in the "Signature Sneaker Releases" section while the models he merely modeled for are listed below. First introduced in January 2017, Puma enlisted the services of the "Starboy" singer to help launch the new silhouette called the Pugma Ignite Limitless. It is one of the merchandises included in the brand's "Run the Streets" project, which aimed to provide products that are inspired by running but are also stylish enough to be used as a lifestyle kick. This sneaker is also available in a few iterations such as the Ignite Limitless NETFIT and Knit model of the Puma Ignite. The Tsugi Jun is one of the many models that continue to keep the brand's Tsugi generation alive. It displays the signature modern look of Tsugi that was first launched in 2015. It is a low-top kick with its tongue-less upper crafted from knitted textile. The shoe functions like a slip-on but features a satin lateral lacing system to provide a lockdown fit. The Weeknd also endorsed some performance shoes. Check them out below. Shopping online is undoubtedly convenient especially for people who are always busy and on the go. However, just like everything, it also has its disadvantages, and one of them is receiving the wrong size of the product you ordered and waited for. One of the items that are most difficult to shop online is shoes, as each sneaker model could fit differently than previous ones. Also, every foot has different shapes, sizes, and needs. Hence, it is never certain every time you decide on purchasing a new model online. The good news is that with trial and error and enough research there is a big possibility that you will select and be guided in choosing the correct size for you. Also to further aid you in purchasing the right size of The Weeknd sneakers, we've rounded up information about most of the shoe models that the musician has released so far. The Weeknd sneakers use standard U.S. sizing and show a difference of 1.5 sizes between men and women's sizes. For example, ladies with a shoe size of 6 should get a 7.5 when shopping for men's shoes while the guys should go 1.5 sizes up from their standard shoe size when buying in the women's footwear category. Based on the majority of the reviews, The Weeknd sneakers are often crafted from leather uppers with a mid-top silhouette. For the most part, all designs received a summary of fitting true to size with a couple saying it feels bigger than usual but nothing major that needs taking adjustments for. How much do The Weeknd sneakers cost? Sneaker collaborations are usually the most expensive pairs in the market. Why? Well, aside from commissioning well-known personalities to design a particular brand's footwear, collaborative sneakers are most of the time limited in nature and are deemed to be unique and exceptional. Also, the market's demand for these types of releases is on such a massive scale that a whole new market was born – the reselling market. One of the few brands that have been consistent in introducing new collaborative pieces is Puma. The brand had commissioned numerous other companies and personalities in the past to put their twist on Puma's classic silhouettes, and some of the past collaborators include Solange Knowles, Va$htie, ALIFE, and Alexander McQueen. One of their most recent collaborators is The Weeknd. The musician did three signature shoes with the brand so far, and these shoes were priced relatively higher than Puma's standard shoe models. Check out the price list of The Weeknd's sneakers below. Looking at the sneakers that The Weeknd has designed so far, there are apparent similarities between them. It seems that Abel has a signature style when it comes to creating sneakers. Here are some of the similar characteristics that his signature sneakers demonstrate. From his collaboration with Alexander Wang to all his Puma designed sneakers, all of The Weeknd's signature shoes so far display a tall profile. These kicks' relatively high construction resembles military-inspired boots as it features sleek ankle area that is reminiscent of the army's footwear. 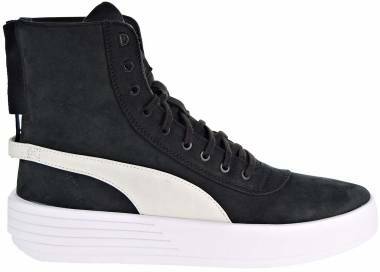 The Weeknd's sneakers with Puma all have a mid-top profile while the Alexander Wang piece has a high-top construction. The Weeknd likes to keep his sneaker designs simple. The sneakers' simplicity provides versatility for easy matching with a wide array of casual outfits. Moreover, the absence of complication balances out the bold silhouette and offers refinement and sophistication. Keeping in line with the upper's versatile and simple design, The Weeknd likes to bathe his signature shoes with colors that are classic and easy to pair with a multitude of ensembles. Most of his releases are dressed in black or white colorways with a few soaked in grey and olive tones. These subdued color schemes provide a timeless appeal that could prove to be fashionable no matter the latest trend. Born as Abel Makkonen Tesfaye in Toronto, Canada, The Weeknd is a 28-year-old musician who has dominated the hit charts numerously. He rose to international fame after the release of a single called "Earned It" from the 2015 movie Fifty Shades of Grey. Although The Weeknd has released numerous tracks before this project, the Fifty Shades of Grey song was the track that introduced him to a broader and global audience. He has since been releasing more and more international hits that resulted in a huge following. Aside from his music career, The Weeknd has also ventured into business. He has done a limited-edition collaboration with an electronic cigarette company called the PAX Labs in 2015. Tesfaye also began his own brand slash record label called "XO," where he sells different types of merchandise such as CDs and apparel and also manages other artists. It is also the brand which Puma collaborated with, hence the "Puma x XO" branding in the products' official names. Where can I buy The Weeknd sneakers? Knowing the official websites and stores where they sell authentic sneakers provide a safe and secure shopping experience so that consumers will get the bang for their hard earned buck. Also, if you are knowledgeable about these retailers, it could be easier to compare prices and find the best deal out of all the shops that offer The Weeknd sneakers. Here’s a list of websites and retail stores where you can find The Weeknd’s signature shoes. What were the release dates of The Weeknd kicks? Puma x The Weeknd sneakers were first released in 2017. Dubbed as Puma x XO Parallel, this shoe is the first design that the duo issued. The first colorway's release date was on August 2018 while other colorway options were introduced in the following months after its original introductory time. The XO Parallel's second iteration called the Puma x XO Parallel 2.0 was introduced the following year, in March of2018. The kick featured subtle differences and a new color scheme. While the latest release, called the XO Suede Classic Sneakers, was released in August 2018 not far behind the Parallel 2.0. This kick commemorates the brand's iconic Suede silhouette's 50th anniversary. What sneaker did The Weeknd wear in the Starboy video? The Starboy music video was first released in late September 2016. The video stirred up popular culture's interest for two things: disturbing visuals and The Weeknd's fashionable outfit. Setting aside the controversial visual to your discretion, let's take a look at The Weeknd's much-talked-about ensemble. Many fans and fashion-savvy consumers were intrigued as to what Puma sneakers could The Weeknd be wearing in this video. This pair is called the Puma Ignite Limitless. The kick had not debuted yet when the music video was released. Hence it caused a curious reaction amongst viewers. Ultimately, it is safe to say that the Starboy video has undoubtedly impacted the popularity of the shoe. Will there be more shoes released by The Weeknd? The musician's latest shoe release so far is the XO Suede Classic Sneakers. No word of new The Weeknd sneakers has leaked or has been announced yet. However, the partnership between Puma and The Weeknd is still ongoing so fans should stay on the lookout and keep checking for updates regarding upcoming new sneaker designs. How to clean The Weeknd sneakers? Either nubuck or suede craft all of The Weeknd's sneaker models by far, and both suede and nubuck require the same cleaning techniques. Here are tips on cleaning The Weeknd sneakers properly. Investing in an appropriate brush is a must for caring for suede and nubuck shoes as it can help get rid of dust and dirt trapped in the materials' fine fibers and could also remove marks and abrasions. Using liquid and cream cleaners that are specially formulated for suede and nubuck should be used for an allover and deeper clean. This will help remove everything effortlessly and make your pair look nice and almost new after. To make your newly purchased kicks last longer, protecting them before wearing them is the best way to go. You could do this by applying a special waterproof spray, which will form a protective layer against stains and abrasions.